Syma X5C Drone Review 2019 – is the Syma X5C quadcopter worth the money? Review of features, pricing, flight duration, battery, camera and more. Ever felt inclined to try your hand at drone flying? Of course you have — drones are one of the latest crazes to take the world by storm. In your case, you’re probably looking to quell the curiosity and gauge your skills as a drone pilot, all while having fun. This means you’re likely feeling frustrated at the prospect of forking out a 3-figure sum on something that will come crashing down to the ground sooner or later. No need to put up with that — the Syma X5C Drone might just be the perfect answer for your woes. Opinions from the drone flying community suggest that it’s one of the best entry level drones on the market. At around $50, you get a quadcopter with simple controls and decent flight performance. More importantly, it’s sufficiently strong to withstand bruises and bumps, but small enough to escape the FAA’s radar. No, seriously — the Syma X5C is so tiny that it hardly meets the agency’s minimum size requirement for drone registration. Now that you’re interested, why not take a look at what it has to offer? Weighing about 0.2 pounds, the Syma X5C perfectly encapsulates the meaning of ‘lightweight design.’ This is in spite of the fact that it’s larger than most other nano drones on the market, given its dimensions of 31X31cm. The manufacturer claims that this enhances its outdoor flight performance, specifically by making it less vulnerable to wind. -360-degree eversion: In English, this means that the Syma X5C is capable of performing 360-degree flips. At first glance, it appears that Syma took some cues from the DJI Phantom Vision when designing the X5C. When it comes to price, however, the two are actually poles apart, with the latter being available for a fraction of what the former costs. This is in spite of its stellar features and user-friendly design. In fact, it’s fair to say that the Syma X5C is a standalone drone that balances both performance and affordability. The drone’s flight time is about 7-10 minutes, with the control range distance maxing out at 50 meters. You’ll be hard-pressed to find another model in its price range with comparable stats. The same can also be said of its agility. Like the Hubsan X4 FPV, the Syma X5C is largely designed around the needs of individuals looking to hone their flying skills while still having fun. Still, the latter is arguably a better pick not just due to its lower price, but also because it packs a 6-axis digital stabilization system. The only other entry-level model that offers the said feature is the Sky Viper HD V950, albeit for $40 more. Of course, the X5C’s camera and lack of stabilization are still there to remind that quality comes at a price. 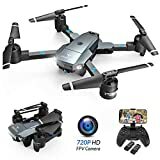 From an overall perspective, though, its performance is pretty impressive for a $50 nano drone. -Solid construction: The X5C is incredibly sturdy for a lightweight quadcopter. -Simplicity of flight: The Syma X5C allows for easy and precise control regardless of how skilled/experienced the user is. It also handles quite well in good weather. -Modular design: The components can be replaced or swapped for different pieces quite easily. -Ambidextrous remote: It’s equipped with a switch to allow users choose a left- or right-handed throttle configuration. -Can’t handle strong winds: The lightweight design means that the Syma X5C becomes uncontrollable when confronted by a strong wind. -Below-par camera performance: This doesn’t do much to support the manufacturer’s claims that it’s a high-definition camera. -Battery: It can be argued that a 90-minute charge time is a little too long for a battery that only lasts 7 minutes. 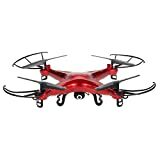 What do Others Have to Say About the Syma X5C Drone? 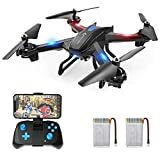 As one of the most popular RC drones right now (and an Amazon best seller as well), it shouldn’t come as a surprise that the Syma X5C has received lots of positive feedback from customers. The majority of comments have highlighted its user-friendliness in both design and cost. The same can also be said of reviews from industry figures — most of them praised its stellar performance despite being affordable. To elaborate, the X5C earned plenty of marks for keeping itself simple, and therefore lending itself to a quick setup. Although some users claimed that they found the drone difficult to control at first, the overall opinion suggests of a small learning curve. 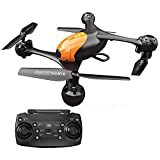 Some even went ahead to recommend the Syma X5C Drone as a great pick for beginners and kids. It’s also evident that the device has an exceptional ability to withstand knocks and bumps. This is aptly summed up by a user claiming theirs ‘flew like normal’ having fallen from a tree. This was after weeks of being stuck up there while exposed to the elements. On the same vein, it’s reported that the modular design of the Syma X5C allows for quick repairs. And because the device is popular, parts are readily available on the cheap. On the flip side, the X5C’s camera was roundly criticized. Most people bemoaned the poor quality of both stills and video, plus the lack of stabilization during capture. According to one particular reviewer, its use in that regard is best limited to an amateur/hobbyist level. Still, they were also honest enough to acknowledge that they didn’t really expect much from such a cheap drone (sic). Nevertheless, the Syma X5C is still a great pick for drone enthusiasts, especially those who are yet to get fully accustomed to the world of quadcopters. On that note, it’s worth mentioning that the experienced drone pilot can also make use of it too. Although it leaves a lot to be desired when it comes to feature range, it’s a much better alternative to whatever else you can find within its price range.